Bulb choices are changing all the time and it's essential to know what options are out there in today's market. To achieve the right lighting, you not only have to choose the right fixture for the right application but the right bulb, too. Clients often come to us with lighting dilemmas such as bulbs burning out too quickly or a fixture not emitting the right amount of light. In many of these cases, the issue can be solved simply by going back to bulb basics. LED bulbs are the best choice when considering our environment. LED converts 95% of energy to light and only 5% is wasted through heat. When you consider an incandescent source only converts 10% to light and 90% is wasted through heat, LED is the best choice where possible. - Go Commercial: Avoid bulbs from mass market retailers as they are often lower quality. Whether it’s a big brand or a store name, it’s better to spend the extra few dollars to get the higher quality, commercial grade bulb. - Stay Within the Wattage: Always check the fixture’s specifications to determine the maximum wattage that should be used. Do not buy a bulb that exceeds this wattage – this can shorten the life of the bulb and also create a fire hazard. - Know Your Line Voltage: Make sure your electrician checks the line for voltage levels and variability in your home. Special rough-service incandescent or xenon bulbs may be required for line voltages that fluctuate and/or are greater than 115 v.
- Bring in the Electrician: Make sure your electrician is informed. Before any new lighting is installed, the electrician should know what type of bulb you are using for each fixture. - LED Basics: When choosing the highest quality LED light look to the CRI value (color rendering index). 80 CRI is the minimum baseline for a quality light source and renders color as close to naturally seen. At Hammerton we use 93+ CRI at a color temperature of 2700K. While 2700K is Hammerton's standard color temp, did you know you can choose a different kelvin range depending on what type of color you want to throw from the lighting source. Talk to your Hammerton representative to learn more. - LED Light Output: To know the overall light output, refer to the lumen value of the bulb. Example: MR16 Halogen = 35 Watt / 320 lumens. The higher the lumen output the brighter the light output. Hammerton lighting fixtures always come with a specification sheet that details the light bulb base and the UL sticker defining the maximum wattage. When choosing a bulb for your Hammerton fixture, you can also refer to the Lamping Resource Guide for details on the bases and bulbs that are compatible with our fixtures. Or, better yet, simply call us at 801-973-8095 to speak to a lighting expert who can help you determine what bulb technology is best for your application. Today, LED light bulbs are replacing traditional lighting plans and florescent lamps everywhere, from streets and living rooms to smart phones and airplanes. The world is now a brighter and more sustainable place thanks to three scientists who succeeded where all others failed in the field of lighting technology. Isamu Akasaki, Hiroshi Amano and Shuji Nakamura were awarded this year’s Nobel prize in physics for inventing the blue light emitting diode. This invention has helped create the transformational (and now ubiquitous) LED light. Akasaki and Amano are both professors at Nagoya University in Japan, and Nakamura, co-founder of Soraa, is a professor at the University of California, Santa Barbara. For over three decades, scientists tried tirelessly to create the elusive blue diode. Red and green diodes had existed for years, but when the three scientists produced bright blue light beams from their semi-conductors for the first time, they overcame one of the greatest technological challenges of the century. By combining blue diodes with existing red and green beams, the trio created the glowing white lamps we now see everywhere. LED lights are on path to dramatically lower the cost of lighting worldwide and shift the industry to a new era of efficiency and sustainability. Unlike red and green diode technology, environmentally-friendly LED lights don’t contain any mercury. Today, they’re replacing traditional light bulbs and fluorescent lamps everywhere, from streets and living rooms to smart phones and airplanes. Congratulations to Akasaki, Amano and Nakamura on this well deserved recognition. For the library of this sleek Las Vegas residence, we designed a trio of custom ceiling pendants by layering woven steel mesh over Tiko ecoresin and bronze finished cylinders. The mesh further enhances the fixture's glow for a striking diffusion of light. An Asian-inspired Tiko weave ecoresin exudes natural warmth as both a drum and pendant. Custom designed for the historic Many Glacier Hotel in Montana's Glacier National Park, this custom parasol pendant is crafted from a leafy ecoresin and matte black-finished steel. Suspended by a stunning aspen branch, this organic contemporary three-drum pool light features diffusers made from a beautiful banana leaf ecoresin. This geometric pool light features an ecoresin diffuser that subtly echoes the wood-like texture of the fixture's meticulously handcrafted steel branch. Also for the Many Glacier Hotel, this large-scale bulb pendant is custom crafted with a slumped organic ecoresin lens material and matte black finish. You may not have heard of ecoresin before, but you’ve most certainly seen it. This translucent co-polyester sheet material can be found almost everywhere you look. In the interior design world, it’s most often used as a decorative architectural panel that diffuses light from one space into another. It comes in a variety of colors, textures and patterns, and it is heat formable. Perhaps the most innovative characteristic of the material is that decorative elements can be suspended within the resin – think leaves, geometric shapes, etc. Another beautiful characteristic of ecoresin is the significant amount of recycled content it contains. Several years ago our design team took a good look at this material and found it was a perfect alternative to traditional lens materials like glass and acrylic, and Hammerton became one of the first to use ecoresin in the fabrication of light fixtures. Today we use the material in a variety of interesting ways, primarily as a means of incorporating an organic aesthetic into a contemporary fixture design. Take a look through the gallery above to see how ecoresin can lend an elegant and earthy aesthetic appeal to luxury lighting designs. You can view more of our ecoresin light fixtures and lens materials by browsing through our various collections, which range from rustic and industrial chic to contemporary and modern. If you’re looking for more assistance, contact one of our team members by emailing info@hammerton or calling 801.973.8095. This custom sconce with decorative blown glass accent features our standard metallic finish in royal silver. The metal bands and backing of this Textured Glass cover sconce are finished with our standard metallic finish in royal silver. This custom vanity fixture boasts an elaborate steel and glass design with a stunning matte black finish. Our cascading Luna Chandelier -- a custom piece from the Lightspann collection -- features blown glass shades and a swirling framework with a gorgeous metallic beige silver finish. This industrial-chic custom wall sconce flaunts a textured metal base and a bold cord finished in matte black. Perfect for an industrial loft or contemporary space, this brushed nickel finished chandelier features a sleek form and custom shades for a sophisticated look. If you’ve ever wondered why Hammerton doesn’t offer chrome or other plated finishes as standard options, just google ‘metal plating facility + Superfund’ and you’ll see 71,700 reasons why. Superfund, of course, is the U.S. Environmental Protection Agency’s program that deals with uncontrolled hazardous waste sites. There are over a thousand Superfund sites across the United States, and metal plating facilities are high on the list. By their very nature, metal finishing industries are highly toxic, but metal plating is among the worst due to its heavy reliance upon dangerous chemicals and compounds like cyanide, chromium and cadmium. Yes indeed, the process that creates that shiny finish on your kitchen appliances and bathroom fixtures uses highly toxic chemicals to do so… and the waste from this process frequently ends up in our ground and surface water. That’s when the EPA steps in. Is a shiny finish worth risking our environment and our health? We don’t think so. At Hammerton, we take pride in applying the highest standards of quality, aesthetics, functionality and environmental compliance to every one of our products, and that includes our finishes. All of our 30+ finishes are not only beautiful and durable — they’re also very environmentally friendly, and many of them offer beautiful substitutes for plated finishes. A few are highlighted in the gallery above. Hammerton’s proprietary finish process is just one example of how we minimize our impact on the environment. We also source our raw materials domestically, we use recycled materials whenever possible, and we fabricate 100% of our products here in the U.S., among other conscious efforts. Want to speak with a Hammerton representative to learn more? Give us a call at 801.973.8095 or email us at info@hammerton.com. This show-stopping chandelier features graceful layers of fine woven steel mesh and slumped fused crystal glass. Rough edging of the glass panels add textural interest and underscore the fixture's artisanal nature. Designed with lashed rawhide and antique copper finished steel, this diamond-shaped pendant mixes rugged materials with clean lines for a sophisticated, rustic chic look. This stunning custom Chateau chandelier is crafted from stenciled panels of seeded and frosted glass set against an elegant geometric pattern created with a matte black-finished steel framework. The blown glass bauble dangling from the bottom of the fixture adds a touch of glamour. An eclectic twist on the traditional drum fixture, this Lightspann Aurora Chandelier features vintage light bulbs gleaming behind a sheer black shade, accented with a whimsically colorful shower of blown glass baubles. Fused textured crystal glass and smooth steel are brilliantly combined in this boldly tiered contemporary-style custom chandelier. The panels of this shimmering Lightspann drum chandelier are custom crafted from kiln-fired artisan glass. Blown glass spheres drip and dangle for added sparkle. This extraordinary Tuscany-inspired alabaster chandelier features impressive metalwork and lava-style blown glass shades for a look that's nothing short of remarkable. At Hammerton, we’re passionate about exploring – and expanding — the boundaries of lighting design. To do this, we’re continuously broadening our palette of design elements – shape, form, composition, space, texture and, of course, materials. Integrating different types of materials into a single design can result in a delightfully surprising light fixture that pleases the eyes and captivates the imagination. However, it’s impossible to do this well without an intimate understanding of each material, and the knowledge and skill set to transform that material into an integral design element of a functional fixture. That requires a lot of time and resources – which is why many lighting manufacturers limit the palette of materials they use in their designs. While Hammerton’s roots are based in steel fabrication and mountain rustic lighting, we’ve long since evolved into a “materials agnostic” lighting designer and manufacturer of a broad range of lighting styles. From woven steel mesh and artisan glass to parchments, eco-resins and rawhide, the materials we embrace in our designs have become an integral part of our evolution as a leading American lighting manufacturer. We invite you to browse through the gallery above to view some of our favorite custom fixtures that feature an often surprising mix of materials and reflect the sensibilities of our imaginative design team. This unique suspension light, crafted from artisan glass with an antique copper finish, is stunning in its symmetry and simplicity. The fluidity and clean craftsmanship of this piece celebrates the essential ideologies of Arts & Crafts design. 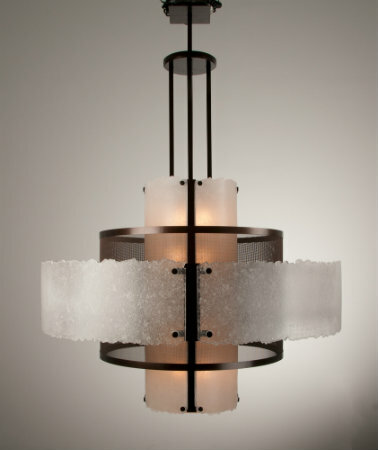 This custom Craftsman chandelier is crafted with mica glass and a dark bronze finish. You can certainly see the architectural inspiration from Greene and Greene -- the strong tapered sides and articulate horizontal lines give this fixture a bungalow feel, as well as sculptural prowess. In the spirit of Frank Lloyd Wright, this sleek and strong pendant design is both cohesive and organic. The fixture embodies effortlessness and simplicity while also treating the eye to intriguing depth and dimension. This pool light design is an artistic interpretation of some of the most basic concepts idealized by Frank Lloyd Wright. Stark lines and junctions are modernized by unexpected, contemporary materials, including polished metal and blown glass to achieve an unusual statement piece. The expressive lines and handcrafted details of this pool light honor true craftsmanship as the fountainhead of good design. This fixture design is all about meticulous craftsmanship. By elevating functional clasps and joints to aesthetic details, an understated silhouette is transformed into an impressive work of art. This subtly organic dome fixture combines principles of Arts & Crafts design with more contemporary metalwork details. A bold stained glass accent provides an eye-catching Frank Lloyd Wright-inspired pop of color to this geometric pendant. Anyone familiar with Hammerton’s design sensibility can see how architects Frank Lloyd Wright and the Greene Brothers have significantly influenced our work. These same principles represent the stylistic foundation of Hammerton’s design aesthetic, and some or all of them can be found in virtually every light we build. Take a look at the gallery above to view and read about some of our favorite “organic architecture” inspired custom designs. A large overhead fixture can provide the right amount of lighting and create visual balance in an expansive entryway. Tall chandeliers can be stunning focal point if scaled and styled correctly. Proper planning is essential when incorporating lighting into your home design. A contemporary chandelier and three matching pendants were designed specifically to highlight this kitchen's central island and bar. A well-designed light fixture can perform more than one function at a time. Combining ambient, task and accent lighting in a contemporary dining fixture guarantees greater visual appeal and a more sufficient lighting plan. A simple transitional chandelier featuring a traditional shape and contemporary materials highlights this living room's mix of classic and modern aesthetics. Every year, we routinely work with hundreds of Hammerton customers on various residential and commercial design projects. And along the way, we’ve seen it all — the good, the bad and the ugly. Our attention to the details of decorative lighting plans have helped many clients avert potential lighting disasters — e.g. fixtures that don’t fit through doorways, ceilings that aren’t properly blocked to withstand the weight of a large chandelier, sconces hung in the swing path of a door… you name it. But here’s the good news — with proper planning, all lighting mistakes are avoidable. Based on our extensive experience working with homeowners and our reputation as a leading custom lighting manufacturer, we’ve developed a list of five basic decorative lighting mistakes to avoid during your next home design project. Not Properly Scaling Light Fixtures: Decorative lights should be scaled in proportion to the space it occupies - think room dimensions, ceiling height, furniture plan and flooring configuration, etc. For example, overhead fixtures can be stunning focal points if scaled and styled correctly, but the vast majority of ‘off the shelf’ products are often sized too small for today’s larger homes. Voluminous rooms need appropriately scaled fixtures both to provide the right amount of lighting and to create visual balance with other objects in the room. Overlooking the importance of Fixture Shape. Ever seen a round table with a large square fixture above it? Or a pair of long rectangular sconces awkwardly flanking a round bath mirror? Getting the fixture shape right can make the difference between a visual hit or a complete miss. Consider your furniture and wall accessory plans carefully before settling on a specific fixture. Ignoring Fixture Dimensions and Weight: Whether you’re simply remodeling or building from the ground up, it’s always important to carefully review your fixture’s physical specifications against your elevation and electrical plans before you buy them. This simple, common-sense step can save significant headaches and costs — think chandeliers positioned off-center in a room or over a dining table, sconces mounted too high or low on a wall, pendant rods or cords that are too long or too short, ceiling or wall fixtures that hang in the swing path of a door, and yes — even fixtures that are too large for your contractor to move into a space without yanking out a door or window. Make sure all j-boxes are correctly aligned with desired canopy and back plate locations and reinforced to accommodate heavier fixtures. Skipping the Planning Phase: Proper lighting planning not only saves you headaches, time and money – it will also ensure that your decorative fixtures beautifully enhance both the aesthetics and functionality of your home design. If you’d like to avoid these and other common lighting mistakes, contact Hammerton today for our expert advice. We can assist with selecting light fixtures and developing custom lighting solutions to fit your unique aesthetic and functional needs. A large fixture from our Chateau Collection provides the right amount of lighting for an expansive outdoor area. A Log & Timber chandelier with a maple branch motif and matching wall sconces coordinate perfectly with a rustic exterior. Installing similar light fixtures in both indoor and outdoor spaces creates a seamless transition and increases aesthetic appeal. Outdoor light fixtures must be properly finished in order to withstand the elements. Properly placed path lights can improve navigation and reduce glare at night. There are many factors to consider when creating an outdoor lighting plan. From the initial sketch to the final installation process, planning, selecting and placing custom outdoor fixtures may seem like a daunting task. To avoid major mishaps, make sure to keep the following tips in mind when creating your outdoor lighting design. Remember the Importance of Scale, Proportion and Style: Since outdoor environments are often large and open, it’s important to get the scale and proportion of your exterior lights right for the space. Correctly scaled lighting can transform a forgettable fixture into a stylish focal point, and also ensure proper nighttime visibility and safety. As we've mentioned before, Hammerton can scale any light to suit a specific space. Choose The Right Materials and Finishes: While it’s very common for exterior fixtures to lose their aesthetic appeal in a season or two, you can avoid this by selecting the right materials and finishes to maximize their durability and weather-resistance. Steel is suitable in most dry or damp outdoor locations, although aluminum is ideal for virtually any location, including coastal or tropical areas where corrosive salty air and strong UV are significant factors. Brass is another popular option, as some people like its weathered appearance. Selecting the right finish is critical to fixture’s longevity as well — always opt for powder coat finishes, as wet coat paints rarely are fragile and will degrade quickly. At Hammerton we use super durable AAMA 2604/2605 finishes, which provide the industry’s highest standard for UV and corrosion resistance. Our outdoor fixtures are also marine-grade pretreated, for an added measure of durability. You can learn more about our finishes and pretreatment processes here. Set the Scene with Proper Light Placement: You can improve navigation and reduce glare simply with the right lighting placement. Path lights should be hooded, so the light is directed downward to reduce glare, which can have a blinding effect. In other outdoor areas, opt for dimmers to control light levels. You should also aim to create layers of light that can be turned off and on depending on how much light is needed. Be Intentional About Lighting Design: Because lighting is essential for helping people transition between indoor and outdoor spaces, a good design plan is essential. You can design an outdoor lighting scheme that boosts safety, as well as aesthetic appeal. Adding LED lighting near landings can prevent slip and falls, while also creating a stunning look at night. Installing lights to the top of newel posts is another way to add style and ease navigation. Complement Your Home’s Exterior Design: Take style cues from your home’s exterior design when it comes to selecting outdoor light fixtures. Bronze-colored light fixtures are a popular choice that look good with earth tones. On the other hand, black fixtures work well if your home sports a dark front door and shutters. Fortunately, with Hammerton’s Outdoor Collection you can customize each fixture with a wide range of finishes and styles to suit your home’s exterior space. We can even help you create a completely unique outdoor light fixture from scratch based on your aesthetic needs. As you can see, there are many factors to consider if you’re planning to revamp your outdoor lighting plan this summer. Contact Hammerton to help you select exterior figures that meet both your functional and aesthetic requirements.